The Logitech UE Megablast with Power Up Stand is a powerful portable Wi-Fi/Bluetooth speaker with big, bassy 360deg sound and Amazon Alexa hands-free voice control built-in. Meticulously engineered from the ground-up, the Logitech UE Megablast features custom drivers for full, crisp sound at all volume levels. 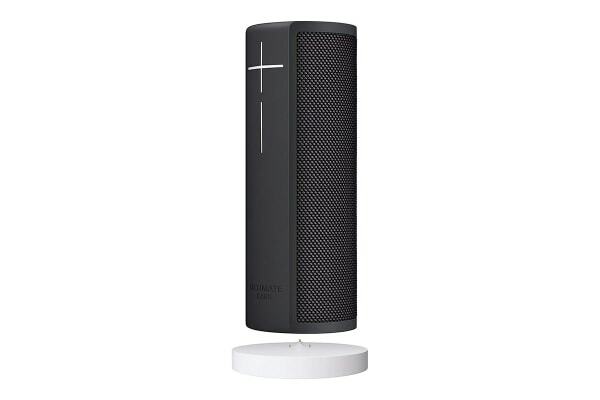 It streams using high-fidelity Wi-Fi or Bluetooth for even better sound. Megablast is seriously rugged, completely waterproof and ready-to-rock any adventure. From the pool to the party and winter slopes, your music will always be on point no matter how wild things get. It’s the ultimate endurance speaker – rugged, portable and unreal battery life that goes as long as you do. Blast tunes from the sunset beach party to the sunrise after party, all on a single charge. Ultimate Ears Power Up makes charging Megablast super easy. Crank tunes or access any of Alexa’s crazy skills, all while charging. Power Up’s sleek design looks awesome with any megablast.